Download the free eBook from Bandzoogle HERE. Some band websites simply have a calendar widget somewhere on their Homepage, but once a fan clicks away to another page on your site, the information isn’t obvious for them to find again quickly, if they even noticed it in the first place. Other sites place a calendar widget in a sidebar that appears on every page. Although this is better than simply embedding a widget on the Homepage, it can cause clutter on pages where that information isn’t relevant. By having a Shows page (or “Events” / “Calendar”) as part of your main menu, it ensures that no matter where a fan is on your site, with one click they can easily find your upcoming gig dates. Date: Include the day, date, and year. Time: Besides when the show starts, you can also add details for when the doors open, and when exactly you’re scheduled to go on. Venue: The venue name, address, link to the venue’s website, a link to a map, and directions to get there. You could also mention if there’s parking at the venue. Ticket Info: How much is the show? Is it pay at the door? Can tickets be purchased in ￼advance? If so, include a link to buy tickets. ● Is the show All Ages? Private Events: Although your fans can’t go, it shows that you’re active and open to performing private functions, which can be good paying gigs. House Concerts: Sometimes house concerts can be invite­-only, but again, it’s important to show your activity, and it lets people know that you’re available for house concert gigs. Conference Showcases: Though not open to the public, when bookers visit your website, having conference showcases listed looks good. Also, for industry people at the conference, they’ll sometimes want to get details about your showcase, so it's a good idea to list it on your website. College & University Gigs: Once again, it might be the case that these are not open to the general public, but it’s important to list them to show that you’re getting hired by colleges & universities. This could help lead to more college & university gigs, which tend to be well­-paid. Fundraising Events: If you’re playing an event to raise money for a charity or an organization you support, list it as well. It shows that you’re active in your community and are willing to play benefit shows, which can make for feel­-good stories in the media, and lead to increased exposure for your band. Previous Dates: Although not necessarily relevant for your fans, it can be a good idea to list your previous events to show bookers/festivals/media how active you are. This could be a full list of your previous events, or you could simply highlight some of your bigger shows. Important note: If you don’t have any upcoming dates, don’t leave your calendar page blank. Let people know what you’re up to by adding a message saying that you’re currently looking to book shows, writing material for a new album, or in the studio recording. Many websites that have a Shows page simply have a listing of upcoming dates. This definitely serves the purpose of the page, but you can make your live shows even more enticing by adding some visuals. The first thing you can do to make your calendar page more visually appealing is to include a show poster/image for each upcoming show. You can also add some of your best live photos to the page to give fans an idea of what the experience of seeing you live is like. Gal Holiday’s Shows page is a nice example of this: www.galholiday.com/shows. Even better than adding some live photos? Add your best live video to your Shows page. Maybe a friend of one of your fans is checking out your page to get details on the show to decide if they’re going to attend or not. A great live video might help get that person to leave the comfort of their home to come check out your set. Also, bookers will often visit the Shows page of a band’s website to see their activity and make a decision whether to book them or not. A good quality live video can say a lot to a booker about the level of performance you can offer, and the experience you can give to an audience. Last but not least, you should add a call­-to-­action to your Shows page. Again, a call­to­action is meant to direct people to do something specific while on the page. For your calendar page, you could add a call­-to-­action encouraging people to contact you for booking information. Mention what types of gigs you’re available for (private events, fundraisers, house concerts, etc. ), then provide a link directly to your Contact page, or have a contact form for booking requests right on the Shows page. 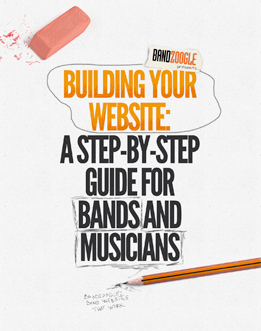 Download the entire "Building Your Website" eBook from Bandzoogle HERE.